Book Description (from Goodreads): "Part memoir, part micro-history, this is an exploration of the present through the lens of the past. We all know that the best way to study a foreign language is to go to a country where it's spoken, but can the same immersion method be applied to history? How do interactions with antique objects influence perceptions of the modern world? 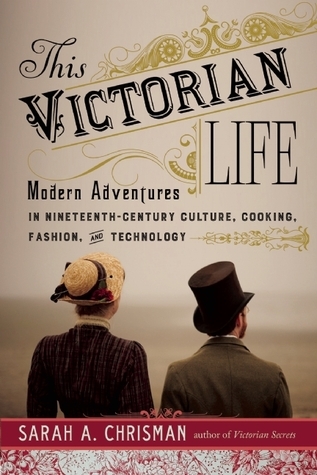 From Victorian beauty regimes to nineteenth-century bicycles, custard recipes to taxidermy experiments, oil lamps to an ice box, Sarah and Gabriel Chrisman decided to explore nineteenth-century culture and technologies from the inside out. Even the deepest aspects of their lives became affected, and the more immersed they became in the late Victorian era, the more aware they grew of its legacies permeating the twenty-first century. Most of us have dreamed of time travel, but what if that dream could come true? Certain universal constants remain steady for all people regardless of time or place. No matter where, when, or who we are, humans share similar passions and fears, joys and triumphs. In her first book, Victorian Secrets, Chrisman recalled the first year she spent wearing a Victorian corset 24/7. In This Victorian Life, Chrisman picks up where Secrets left off and documents her complete shift into living as though she were in the nineteenth century." This is the kind of book I really love and, in fact, this was one of the most interesting books I've read in a long time. However, the author's attitude was a big turn off for me. In several cases throughout the book, Chrisman discusses some of the negative attention they receive for living an out-of-the-norm lifestyle. Granted, this is part of her describing their reality so I wasn't irritated that she brought it up, I was more annoyed by her attitude about it when I thought about my own experience. When I opened up Facebook the next day to find another article on them based solely around the fact that people are mean to the Chrismans, it just rubbed me the wrong way. I, too, live an out-of-the-norm lifestyle. I have nine children whom I homeschool. I choose to wear long skirts and long hair and remain unemployed. I drive an enormous van. People stare and lift a finger to count when we drive by. I get all kinds of snotty comments, rude questions, and invasions on my privacy and lifestyle. What I've found over the years is my defensive actions and snotty comments back only feed the fire. The meaner I am back to people like this, the more attention I give them, the worse it is for me. Once I started holding my head high and refusing to apologize for my choices, I was amazed at how people started complimenting and encouraging us. All that to say, when all I see on this couple is them complaining to the media about not being accepted in a society that promotes diversity, (a phrase she repeats on multiple occasions in her narrative) it lowers my esteem for them quite a bit. In Victorian society, one conformed to the norm or one was ostracized by every so-called decent member of society. I guess what I'm trying to say is if one is going to take the road less traveled, one must be prepared for the opposition. Discussing the disappointment privately is appropriate---complaining to the media and expecting people to conform to what suits you is not. (See Butchart Gardens story). Now on to the less-bad bits. Besides all the atheistic or pantheistic nods to humanism, macro-evolution, and other ridiculous notions, the author presented herself as an intelligent woman. For the most part, the narrative was well-written. In fact, I had a long discussion with my husband about how publishers and editors really need to hold authors to a higher standard concerning grammar and subject matter. Almost everything I read nowadays is dumbed down to the level of a fourth grader. One would argue that this is the reading level of the average American adult in these times---I would argue back that rising standards usually result in those who will rise up to meet them. Chrisman is obviously well-read---her voice makes that clear. I was encouraged to seek out some of the earlier novels and nonfictions in hopes of finding other intelligently written material. In fact, I'm off to my favorite used book store this morning to do that very thing. Regarding the editing and photography---part of me wants to say the book could do with some serious editing and professional photography; part of me finds it endearing that she would have a friend do her photos. She obviously looks very joyful and at peace in her photos---something she may not have done with a more professional set up invading her space. As for editing, I always blame that on the publishing company. They're being hired and trusted to present her in the best light---authors must hold paid editors to a higher standard. I admire the Chrismans' research on so many things: the Hershey's company, cycling, and some very interesting bits regarding the regulation of time and why timepieces are made with jewels. I'd always wondered about some of these things and Chrisman does an excellent job explaining the whys. I loved all her talk of settings as we are from the Pacific Northwest and enjoyed a brief spell of living in Skagit County near Deception Pass and the Chuckanut Drive that she describes. I know this area well and was able to imagine all the places she described. We spent a lovely morning in her town of Port Townsend, one day about seven years ago, admiring the Victorian homes on our way to pick up our Yorkie. I think the thing that just left a sour taste in my mouth was how the author presented herself. Besides the previously mentioned issues, there were a few times when I thought she was either seriously exaggerating a situation or she was just an awfully snobbish and self-righteous boor. She has a way of making others "less learned" than she seem like pitiful simpletons. When describing a memory of ladies chatting about cell phones in a restaurant, she actually describes herself running from the table and spewing her tea into a bathroom sink because she was laughing so hard at their ignorance. Either she is an absolutely obnoxious and immature human being or she has a vivid imagination. Either way, nothing disfavors someone in my eyes more than snobbish, know-it-all behaviour. On a positive note, my good opinion once lost is not lost forever so within ten minutes of finishing the book, I had purchased her previous book, Victorian Secrets and it should be arriving before the week is out. The good and useful definitely outweighed the annoying with this one and I'm looking forward to reading more about this unique and beautiful life the Chrismans are building together. nice review! Wearing the corset 24/7 seems a bit much. I think the ladies took them off at night! Yes, that is my assumption, as well. I'm sure she'll cover that in the book I've ordered as it's mainly about corsets. I'll keep you posted!